Blueberry muffin recipe that delivers big, bakery style blueberry muffins you crave. Loaded with juicy blueberry and topped with a buttery crumb topping. This is the only blueberry muffin recipe you need! One of the best parts of summer is blueberries. Beautiful, plump, juicy blueberries have taken over my kitchen. Not that I’m complaining, I absolutely love eating blueberries. My favorite way to eat them is in a big bowl of greek yogurt and topped with homemade granola. The blueberries we’ve enjoyed have been so sweet lately. I’ve been keeping a bowl on the counter and my daughter and I snack on them throughout the day. Every time I have an abundance of blueberries, I have the craving to make bakery style blueberry muffins for breakfast or as a midday snack. They’re just perfect. But please don’t think you can only use fresh blueberries only in this muffin recipe. Frozen blueberries work great too. Just be sure to thaw the blueberries first and drain the juices. Then, proceed with the recipe as written. I call these blueberry muffins “bakery style” because they’re oversized. They’re the kind of muffins you see in a bakery display case. Big and bold, these blueberry muffins are quick to make and are delightfully buttery. 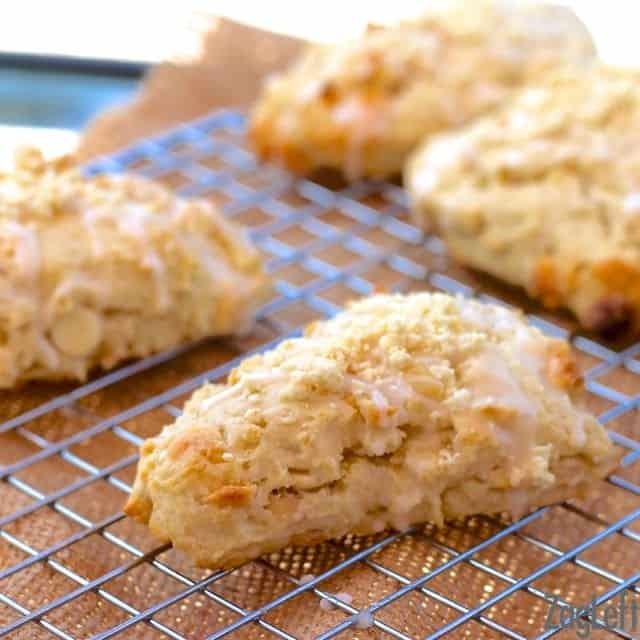 They’re light and perfectly sweet with a delicate, moist crumb. I use plenty of blueberries in this blueberry muffin recipe so you’re sure to get blueberries in every single bite. The crumb topping on top of the blueberry muffins is a simple mixture of flour, brown sugar, nutmeg, cinnamon and melted butter. I spoon a hefty amount of the topping over the tops of each muffin before I place them in the oven to bake. This topping is one I love and use on almost all of my fruit desserts or coffee cakes. It’s buttery and sugary and spiced just right. The trick to making the perfect crumb topping is to make sure to mix the melted butter and the dry ingredients together well, leaving no dry ingredients in the bottom of the bowl. Thanks for reading. Are you following us on Pinterest, Facebook, Twitter or Instagram? We’d love to connect, drop by and say hello! 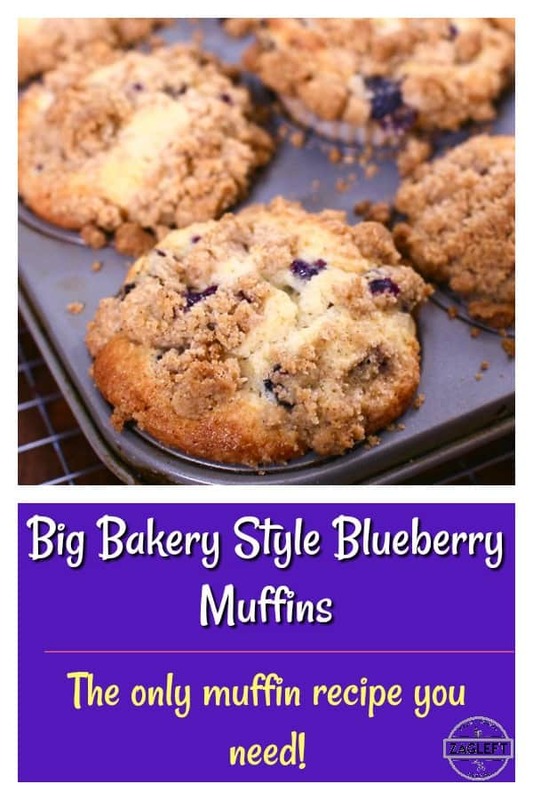 Big, bakery style Blueberry Muffins with a buttery crumb topping and loaded with juicy blueberries. The only blueberry muffin recipe you need! Line muffin cups with paper or foil liners or spray muffin tins with cooking spray. In a large bowl, combine the sugar, eggs and canola oil and mix until well blended. Beat in the milk and vanilla. Add the flour mixture to the egg mixture and stir until batter is smooth. Gently fold in the blueberries. Spoon the batter into the muffin cups, filling them about three-quarters full. Spoon the crumb topping on top of each one and bake for 30 minutes or until the muffins are golden and a toothpick inserted in the center comes out dry. Cool on a rack for 10 minutes before serving. In a medium bowl, combine the flour with the brown sugar, cinnamon and nutmeg. Stir in the melted butter. YUM! These look absolutely amazing, can’t wait to try them. And these muffins look fantastic! Especially the topping. I hope Colleen has a great first day today! One of my favorite weekend baking recipes is muffins…but nothing beats a fabulous blueberry muffin like this with that gorgeous crumb topping!! I love muffins on the weekends too, thanks Lora! These muffins look to die for! Definitely will be saving this recipe for later! Good luck with your youngest in high school too! I hope the day went well for you guys! Ours started school last week and I kind of get that feeling with each new year! Love these muffins and that crumb top! Thank you, Nancy. The day went well and my daughter felt great about today. Hope you guys have a great school year, as well. Thank you, Alisa. I would love to try your dairy-free blueberry muffins, I’ll have to keep an eye out for them. crumb topping is the best, I usually make more than I need so each muffin has A LOT. 😉 I saw so many kids going back to school today, and even last week – so early! I played tennis in high school, one of my favorite things about it! Tennis is such a great sport and it’s something she can enjoy as she gets older too, Colleen loves it. Thanks, Kristina. These look SO good Joanie! I love anything with a crumb topping! Me too, Erin. Thank you! Aww! So bittersweet 🙂 These muffins looks fabulous, by the way! The topping is perfect! My favorite part of the muffin is right there in that big, gorgeous muffin top! Yummmm! Pinning this! These blueberry muffins are the perfect way to start off the school year. My boys start tomorrow. They love blueberries and these would go perfect with a big glass of cold milk. They certainly are, Ali. Hope your boys have a great school year! I LOVE blueberry muffins, and these look amazing! I love that your blueberries didn’t sink in the batter. I have had that happen to me in the past. I feel like ALL muffins have a crumbly topping! That’s the best part! These look delicious! Such an amazing looking muffin! Muffins are one of my fav treats and I’m happy to have found this recipe! Thank you for sharing! OMG… Everything looks so yummy. My mouth is literally watering. Thanks for much for sharing your experience. Nothing better than a crumbly muffin top. YUMMMM! I agree, Chelsea. Thanks so much! “Bakery style” muffins are the best 😀 These look amazing! Just made these! Yummy! This will be my go-to recipe for blueberry muffins from now on! Thank you for sharing! Thank you so much for letting me know you liked the recipe! You totally made my day – have a great weekend! Just baked these and they are ridiculously good!! I left out the nutmeg (not a fan) but added a touch more cinammon and they came out perfect!!! Thank you for the excellent muffin recipe. You are so right, the only muffin recipe I need. Thank you so much, Lisa. I’m so glad you liked them! These are the best muffins I’ve made in a long time. Everything was exactly to my taste and they looked beautiful. Moist, flavorful, perfectl. I’ve hidden one to have myself on Monday morning! Thank you, thank you! Sally, I’m so happy you enjoyed the recipe! Thank you for letting me know how they turned out. Have a wonderful week! Normally I don’t leave comments for recipes, but I had to this time. I made these muffins tonight and they are absolutely awesome! Perfect from the start to finish. The time was right on and did not over bake or under bake. I did substitute 3/4 cup of flour for 100% whole wheat pastry organic flour and since I didn’t have any milk I used half and half. Like I said, they are perfect and will be my only recipe to use for when I make blueberry muffins. It started out that I wanted to make blueberry cobbler, but my blueberry bush didn’t have enough ripe ones so I found this recipe and decided to try it. I am so glad that I did. And since it wasn’t a cobbler I still used vanilla ice cream alongside the warm muffin. So good! Thank you so much for letting me know you enjoyed the recipe. You totally made my day! You’re so lucky to have a blueberry bush that produces blueberries, my blueberries get eaten by the birds so quickly plus, we’ve had so much rain in Houston, nothing is growing the way it should. I bet the muffins were perfect with ice cream. Thanks again for letting me know. Have a great weekend! I’ve been searching high and low for a recipe which came close to our local bakery’s muffins and when I saw your recipe I was very excited. I made the muffins and not only were they easy but they were AMAZING. I feel no need to go get the bakery muffins after trying this recipe. Thank you SO much!!! Made these for breakfast and they were really good! My husband took some to work and everyone asked where he bought them! He told them at a fancy bakery in the mall! Lol I can’t wait to make it again when it’s not 104 degrees outside! These were so good! Made them last night as I had a blueberry muffin craving and they are really great. I had another for breakfast today and they were just as soft as they were yesterday. Will definitely make these again as they were so easy to make and maybe use chocolate chips next time! Thanks for the recipe ? I made these yesterday, and they were wonderful. I brought a couple over to my parents, and it was quite the compliment to watch my mother’s facial expression, who is, by far a better cook than I am, as she tasted them. The only thing I found, was that I found that the amount of crumb topping seemed like too much, for a dozen muffins. They definitely were the best I’ve ever made, and probably the best I’ve tasted. Thanks for the great recipe. I made these yesterday and my family loved them! So fluffy and light!! Will be making them again and again… thank you! Do you have any other delicious muffin recipes? I'm new to this and I would love to try the raisin bran ones. Thanks! I'm so happy that you enjoyed the blueberry muffins, they're my favorites too! Thank you so much for letting me know you liked the recipe. Here are a few of my other favorite muffin recipes and a banana bread recipe that also makes great muffins. Thanks a million! I will certainly try a few of these! Thank you for the perfect Blueberry Muffin..they are better than the cafe style. Hi! I made these about a month ago and i loved them!!! They were absolutly delicious. I made them in a regular 12 cup pan but wasnt sure if i was supposed to use a pan with 6 jumbo cups? I must have adjusted my bake time, i cant remember but they were moist, and the perfect amount of sweetness. Only muffin recipe u need 😊 I’m thinking by the photo it must reg size and they just have bigger tops. What would u say a good time/temp would be using jumbo muffin liners? These are so delicious! I made them tonight. Everyone LOVED them! I’m so happy you loved the recipe, Kathy! Thank you so much for letting me know. CAn you use the 30 calorie almond milk for the regular milk? Thanx, I will definitely be making these!